"Offering games from RTG, Bovada presents a realistic gambling experience that is easily accessed by US players and the selection of video slots is one of the best of any RTG powered site." 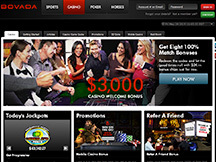 Bovada Casino was once known as Bodog and is one of the top rated sites catering to American gamblers. Here, one can enjoy a stellar array of games that can be enjoyed for free as well as for real money. Bovada offers unique bonuses and promotions and always offers extreme measures of player support and protection. This online casino has a long and solid history and is one of the most trusted US friendly sites operating. At Bovada, players can expect to access a wide range of casino games, just like what is offered at a land based casino. With great video slot titles, realistic table and card games and some specialty games, there is something for all players who register. Bovada is licensed and regulated and adheres to local gambling laws, always offering privacy and protection to each and every player that visits the site. With download and instant play games, Bovada is accessible to all players, including Mac users. Every player that creates a real money account at the casino will benefit from match bonuses on multiple deposits. The total bonus offer can be worth as much as $3000 and the bonuses are divided by game type. For slot fans, there is a 100% match bonus worth up to $500 and this can be redeemed four times. For all other games, the match bonus is also 100% but is worth only $250, also redeemable four times. Bovada also offers daily and weekly promotions like giveaways and table game specials, so there are plenty of ways to enjoy free money as a registered player. When downloading the casino software, one will have access to more than 200 amazing game titles. The majority of the games that are featured are video slot selections and players will enjoy top rated titles like Aladdin’s Wishes, Crystal Waters and Sushi Bar. The top played progressive slots include Shopping Spree and Midlife Crisis, both exceptional video slots with huge payouts. While video slots are a main attraction, there are also other games that can be enjoyed at Bovada. With a full selection of RTG games, players will find all their favourite table and card games, ranging from a simple blackjack variation to European and American Roulette. There are also some amazing video poker games supported as well as Keno and scratch cards. Seeing as this online casino is US friendly, most of the banking options will cater to these players. Bovada supports the use of MyPaylinQ, credit cards and Rapid Transfer. Using secure encryption software, all player information is safe and secure at all times. Most deposits are processed instantly and there is a minimum deposit amount of $20. For withdrawals, players can choose from a check, Rapid Transfer or MyPaylinQ. The casino will cover the fees for one payout per month. There are withdrawal limits in place. For checks, the limit is between $20 and $3000 and for rapid transfers, the limit is between $100 and $750. Checks will be received in 1-2 weeks and rapid transfers will be processed within 24 hours. Bovada offers a standard loyalty program, where players will earn points as they wager on their favour games. These points can be redeemed for cash and as players earn more points, they will advance in tiers. Those that frequent the casino and play often will climb the ladder quickly and can become a VIP player, which offers additional bonuses, higher comp points and special invitations to casino events. Bovada remains one of the top rated sites for any US gambler and with a vast selection of games from RTG, this casino offers everything players could want. There are superb bonus offers and excellent customer support reps always standing by to ensure every player has a positive and rewarding experience. Are you ready to play at Bovada Casino? All countries, except for the U.S.